In its advisory published Thursday, Apple described the bug as "a logic issue existed in the handling of Group FaceTime calls," that also impacted the group FaceTime calling feature on Apple's macOS Mojave 10.14.2. According to media reports, Apple has confirmed to "compensate" the family and help towards the teenager's future education costs as part of its Bug Bounty program, though it is unclear how much the company is going to pay. 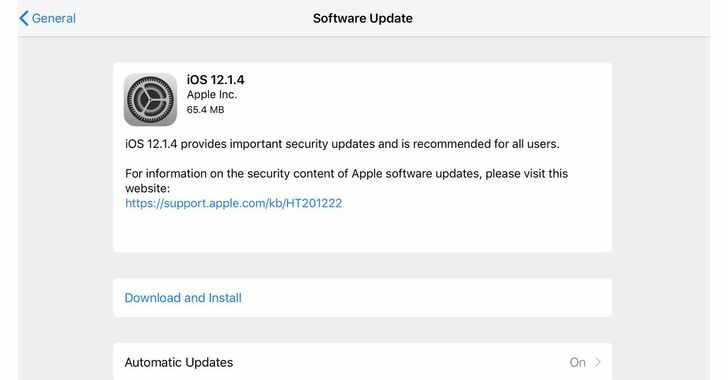 If you haven't yet, you are highly recommended to update your Apple devices with iOS 12.1.4 release, which is available for the iPhone 5S, and later, iPad Air and later, and iPod touch 6th generation. To run the update on your iPhone, iPad or iPod, just go to Settings→ General → Software Update and click the 'Download and Install' button. To update your Mac computer, just go to Apple menu in the top left corner of your computer, select 'System Preferences,' click 'Software Update' and download the new update.